Warren St. John is a reporter for "The New York Times" and the author of the national bestseller "Rammer Jammer Yellow Hammer." "Not merely about soccer, St. John's book teaches readers about the social and economic difficulties of adapting to a new culture and the challenges facing a town with a new and disparate population. Despite their cultural and religious differences and the difficulty of adaptation, the Fugees came together to play soccer. 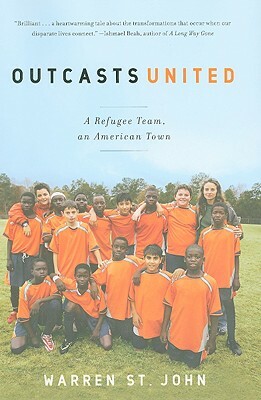 This wonderful, poignant book is highly recommended..."
A "richly detailed, uplifting account of a young Jordanian immigrant who created a soccer program in Georgia for young refugees from war-torn nations . . . educational and enriching." "St. John hits a trifecta . . . A fascinating and fast-moving account of big-picture politics, small-town sports, and some very memorable people." "Inspiring...richly detailed...Deeply satisfying...a bighearted book." "As St. John tells it, the Fugees’ story is something of a radical social experiment: a test case in 21st-century immigration and identity politics. But it’s also a deeply moving example of what men and women of goodwill can do."